Answer: The most interesting data point that came from last week’s mid-year real estate review was that, for the first time in years, condo prices appreciated significantly from the first half of 2017 (9.1% growth). I received a number of emails from readers asking if this growth occurred across the entire condo market or in specific locations or buildings so this week’s column takes a deeper dive into the 2018 mid-year data for condos in Arlington. The good news for condo owners in Arlington is that appreciation and demand increased across all markets in the first half of 2018. In fact, 63 of the 79 measures for appreciation and demand improved (if you’re a homeowner/seller). To test the market, I looked at average price and three demand indicators (days on market, purchase price to asking price ratio, and number of sales) broken out by zip code, building age, and price range. The data compares pricing and demand trends in the first half of each year for all condos sold in Arlington. 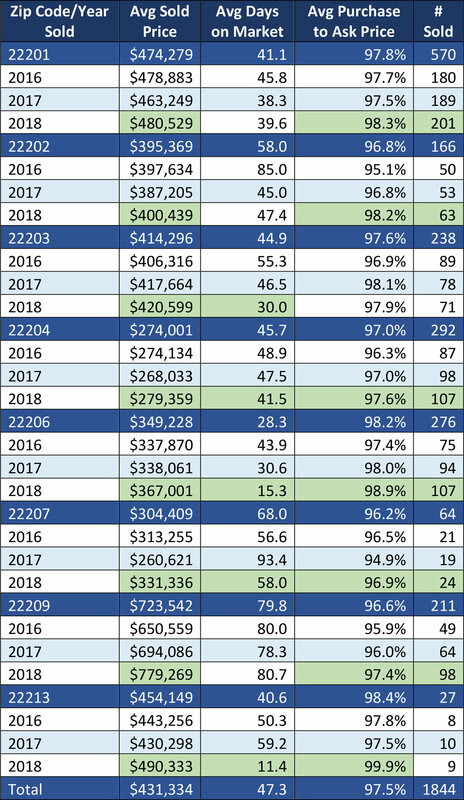 Cells highlighted in green indicate improvement (for homeowners/sellers) in that category for 2018. Demand indicators supported the price growth, with most zip codes seeing a faster pace of sale and buyers negotiate less off original asking prices. For those tracking new construction in Arlington, only 11 of the 98 sales in 22209 were in Key & Nash and it’s important to note that builders do not enter all of their sales into the MLS, so a large percentage of those sales are missing from the data. Note that 22205 is not included because of the lack of volume. Many older buildings in Northern VA are struggling to recover from their peak pricing from 2005-2007, which has left many owners in a difficult financial position. The strong appreciation seen in condos built before the 1970s will be a much-needed relief for many and proves that Arlingtonians and investors are seeing value in older, less expensive condos compared to their newer, amenity-rich neighbors built in the last 20 years. Check out the huge drop in average days on market for condos built in the 1950s or earlier! If you own a condo in Arlington and would like to take advantage of the recent appreciation of your property, feel free to email me at Eli@EliResidential.com to schedule some time to talk about your options.